In this paper, we characterized the behavior of polymer jet from near-field electrospinning onto the inkjet patterned paper with conductive Ag nanoparticles in order to form the controlled three-dimensional nanostructures. Using inkjet patterned paper with conductive ink as a collector, the polymer jet is induced to the pre-patterned shape through the concentrated electric field caused by singularity between the spinneret and the printed patterns. Due to the electric field enhancement of the deposited electrospun fiber, an additionally spun fiber can be stacked on the deposited fibers directly. Therefore, the controlled three-dimensional nano/micro structures can be successfully realized by the proposed method. We characterized the deposition of the electrospun fiber according to the distance between the inkjet printed pattern and the spinneret. In addition, the sharp edged three-dimensional microstructures were fabricated by carrying out the electrospinning on the patterns with various angled edges. A CCD camera was used to observe the behavior of the polymer jet, and the SEM image was analyzed to confirm that the fibers are stacked as desired. Electrospinning is a widely used technique for making micro-/nanoscale fibers using polymer solutions . Utilizing the advantages of electrospun fibers with the smaller diameter and higher surface area compared to conventional fibers, they can be used in various fields such as biomedical, pharmaceutical, optical electronics, healthcare, biotechnology, environmental engineering, and so on [2, 3, 4, 5]. The diameter and morphology of the electrospun fiber can be varied by controlling the properties of the selected materials and the environmental conditions of the fiber production . Near-field electrospinning (NFES) have shown the superior performance in the positioning of individual nanofibers precisely, compared with conventional far-field electrospinning (FFES) . The NFES technique is the method for direct-write deposition of nanofibers, and is useful for controlling the morphology of the fibers [7, 8]. 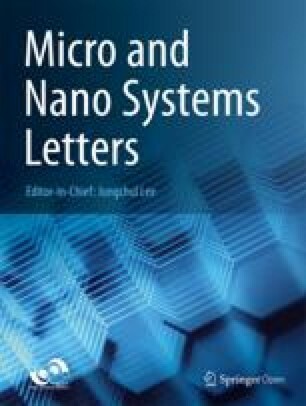 Recently, in 2010, through NFES techniques, three-dimensional nanofibrous structure patterned on silicon a wafer were fabricated by Wang et al. . In 2014, Lee et al. fabricated a single nanowall on the plated glass substrate. Then, in 2015, Luo et al. carried out NFES repeatedly on commercial printing papers to produce three-dimensional structures with various shapes. In general, NFES technique stacks the fibers in a layer-by-layer manner by directing the jets to the pre-deposited fibers using the concentrated electric field. Therefore, it is possible to improve the performance of sensors and actuators through 3D stacked fiber . Despite the dramatic improvements in fiber controllability, there is still a limit. When the curved electrospun fiber pattern is constructed by the NFES method, the tension caused by the pre-deposited fibers acts as a centripetal force against the polymer jet, therefore, the pattern formation with sharp edges is not possible; the rounded corner is possible. To address this problem, there has been an attempt to reduce the tension by reducing the speed of the moving stage when the edge part was spun . However, this process is complicated, since it is necessary not only to conduct accurate stage adjustment but also to adjust the jet speed according to the stage deceleration to form a uniform fiber. In this study, in order to realize nanoscale 3D structures by the controlled stacking using NFES, we characterize the stacking quality of electrospun fibers according to the established electric field between the inkjet printed conducive pattern and the spinneret (needle tip) and confirm their stacking status by experimental study. Inkjet printed electrodes composed of Ag nanoparticles have a role as a collector to induce the electrospun fibers to the printed electrodes: the electric field singularity on the planar conductive pattern concentrates the electric field at the edge of the pattern . The electrospun fiber behavior is characterized by analyzing the fiber stacking condition according to the position of the needle and location of the conductive pattern. The sharp-edged 3D structures are demonstrated by inducing the electrospun fibers to the sharp-edged conductive pre-patterns on the commercial printing paper, which has been impossible in the conventional NFES. A4 size commercial printing paper (Double A) was used as a substrate for inkjet printing and Ag nanoparticle ink (NBSIJ-MU01, 15 wt%, Mitsubishi Paper Mills Ltd., Japan) was used to form conductive patterns on the printing paper. A Dimatix material printer (DMP-2850, Fujifilm, Japan) and the dedicated cartridges with a drop volume of 1pL and 16 nozzles were used to print the precise pattern. The conductive pattern was printed at 1693 DPI resolution with a dot spacing as 15 μm × 15 μm. For the line pattern experiment, 1 mm × 100 mm rectangular pattern was printed in three layers. For the angled pattern experiment, an acute angle with 45°, a right angle with 90° and an obtuse angle-conductive pattern with 225° were printed on the paper, respectively. After printing, printed paper was baked at 150 °C for 15 min on a hot plate for thermal sintering, and a copper tape was electrically connected with the patterns by conductive epoxy paste. Figure 1a shows the preparation process of the paper substrate with conductive patterns for electrospinning. The paper was bonded to an acrylic plate for electrical isolation. In this study, 17 wt% poly (vinylidene fluoride) (PVDF) solution was used. PVDF powder (Sigma Aldrich, average Mw ~ 534,000) was dispersed in acetone and dimethyl sulfoxide (DMSO) (Sigma Aldrich, ACS reagent ≥ 99.9 %). Capstone FS-66 (Sigma Aldrich) was used as an anionic surfactant. To synthesize the polymer solution, 1.7 g of PVDF was added to 5 g of acetone and dispersed for 30 min using a magnetic stirrer. At the same time, 0.5 g of Capstone FS-66 was added to 5 g of DMSO and dispersed equally using a magnetic stirrer. After that, a mixture of Capstone FS-66 and DMSO was added to the mixture of PVDF solution and mixed with a magnetic stirrer for more than 1 h.
For the electrospinning, a system (ESDR200H, NanoNC) with integrated motion stage (linear servo motor 800 W, maximum run speed 500 mm/s), a high voltage generator (~ 30 kV) and syringe pump (minimum z-axis direction speed 8.3 μm/min) were used. A Hamilton gastight syringe (100 μL) was used for precise polymer solution flow rate control, and a 32G steel needle with an inner diameter of 100 μm was used. Figure 1b is a schematic diagram for the proposed electrospinning experiment. For the line pattern experiments, the gap between the paper and the needle was set to height, and the distance between the edge of the pattern and the needle was set to offset. The motion stage speed was fixed at 10 mm/s and the flow rate was fixed at 14 nL/min. The experiment was repeated 50 times on the same path with the fixed voltage to observe the status of stacked fiber. 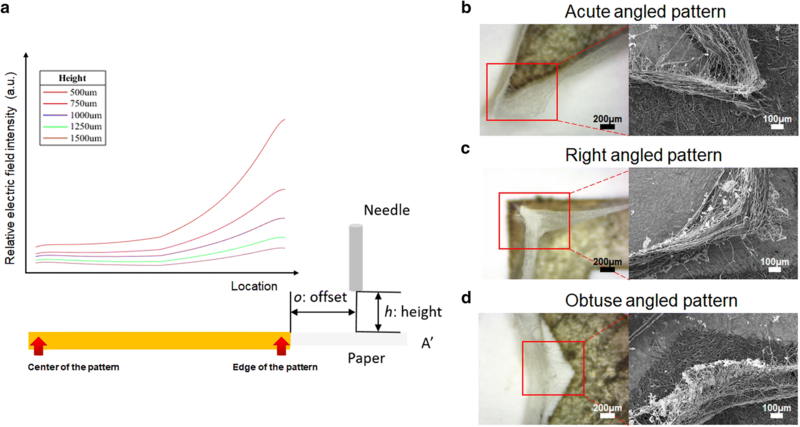 Experiments on sharp-edged shapes pattern were performed with the constant distance between the edge of the pattern and the needle path with 150 μm offset and 750 μm height value, and with 1.9 kV voltage. During the process, the jet ejection was monitored in real-time using a vision system (EV200L, NanoNC). Figure 1c was the captured image of the induced fiber during the electrospinning process. Charge-coupled device camera (CCD camera) and a scanning electron microscope (SEM) was used for observation of the fiber deposition and stacking. The electrospinning technology, which can deposit nanofibers emitted from a liquid droplet is an attractive and viable process . The key factors for determining the deposition behavior of electrospun nanofiber were the electrical field distribution and the surface charge density on the nanofiber [9, 10]. The electrical field distribution above the conductive collector plays a critical role to guide the deposition of nanofibers, and especially, because the electric field is enhanced by electric singularity between the spinneret and the edge or corner of conductive pattern, the electrospun fibers can be induced to the desired position using this electric singularity. By investigating the stacking of the electrospun fibers according to the variation of condition for electric field, we tried verifying our concept. First, fiber ejection was tested on the conductive straight line pattern with the various offset and needle height. Then, we obtained electric field intensity using the following Eq. (1) by dividing the experimentally set potential (V) into the distance between the tip of the needle and the edge of the pattern (o and h denote offset and height of the needle). Figure 2a represents the electric field intensity determined by Eq. (1). The intensity of the electric field for continuous jet ejection was almost similar except that the angle between the needle and the edge of the pattern was small: the needle height is small and the offset is long. For experimental verification, repetitive electrospinning was conducted to form the stacking fibers using the pre-patterned conductive electrode on paper. The conditions of needle height and offset were determined according to the results from the calculated electric field. That is, to confirm the simulation results, two different conditions presenting high electric field case (750 μm height, 600 μm offset) and low electric field case (1500 μm height, 600 μm offset) were tested. Figure 2b, c show SEM and CCD camera images of the electrospun fibers, when high and low electric field conditions were applied respectively. Through the image verification, it was possible to check whether the fiber stacking was controlled well or not. In Fig. 2b (high electric field case), it was found that the fibers were stacked well along the edge of conducted pattern. On the other hand, Fig. 2c (low electric field case) shows the case where the fibers were not stacked and spread around the pattern arbitrarily. A simple modeling was carried out by referring to the previous research about electric field singularity at sharp edges of the conductive pattern . The relative electric field values according to the 2D position on the conductive pattern and variation of the height of the needles were calculated using Eq. (2); the offset between the needle and the edge of conductive pattern was fixed as 450 μm (Fig. 3a). From here, it was found that the relative electric field was higher as the needle height was lower. The relative electric field was also much higher at the edge than at the center of the conductive pattern. This calculated result shows the good agreement with the experimental result in Fig. 2a: The case of relatively lower height of needle shows the higher electric field. This result, that is, the low relative electric field results in the unstacked patterns, was confirmed by experiment: When the needle height was relatively high, the stacking is failed. The electric field singularity of the edge of the pattern was also weaker compared to the well-stacked conditions. Compared to conductive straight line patterns, curves pattern with acute angle was known to have a higher electric field singularity . In the conductive pattern with the acute angle, the electric field singularity increases gradually from the peripheral to the intersection of the angled pattern. On the other hand, as the angle increases to an obtuse angle, the electric field becomes higher at the edge of peripheral than the intersection point. Therefore, in the case of an acute-angle conductive pattern, the electric field at the corner pattern is high, but the obtuse angle shows the low electric field at the corner. The effect of electric field on curved patterns was verified by observing the stacks of electrospun fibers on the patterns that were acute, right and obtuse angle-edge. Figure 3b, c, and d show the images of the electrospun fibers stacked on the conductive pattern with acute, right and obtuse angles. As expected, the fibers in the acute angle pattern could be perfectly stacked along the pattern due to the high field intensity by the field singularity (Fig. 3b). The fibers on the right angle pattern could be stacked along the pattern, but they did not perfectly follow the conductive pattern like on the acute pattern. They stacked toward the slightly inner side of the pattern edge due to the smaller electric field compared to the acute angle pattern (Fig. 3c). The fibers formed on the obtuse pattern did not follow up the pattern due to the weaker electric field than the surrounding area (Fig. 3d). Near-field electrospinning is a novel technology that is able to realize three-dimensional micro/nanostructures from the controlled fiber stacking. However, due to the developed tension during the electrospinning, it was difficult in patterning the sharp-edged structure. In this study, the sharp-edged 3D microstructure was successfully electrospun by using the enhanced electric field from the printed conductive pattern on paper, and the good stacking condition for electrospun fibers was analyzed through the electric field modeling. The electrospun fiber was stacked well under high electric field conditions as follows: (1) In the linear conductive pattern, when the angle between the conductive pattern and the needle tip is small. That is, when the needle height is low under the same offset condition. (2) At the edge of the conductive pattern. (3) In the curved conductive pattern, the acute angle pattern is higher than the obtuse angle pattern. The formation of various 3D micro/nanostructures through the proposed method makes it possible to extend the application and versatility of electrospinning, which can be used as a nanoscale 3D printer. JSK and BHM carried out design and fabrication, measurement and analysis of the results, and drafted the manuscript. JYP performed analysis of results and drafted the manuscript. All authors read and approved the final manuscript. We also thanks to members of our laboratory (NanoBiosystem and Manipulation Lab.) for sincere comments on this research. This study was supported by the Basic Science Research Program (2017R1A4A1015564, 2017S1A5B6054769, 2018K1A3A1A21043506) through the National Research Foundation of Korea funded by the Korean govern ment.